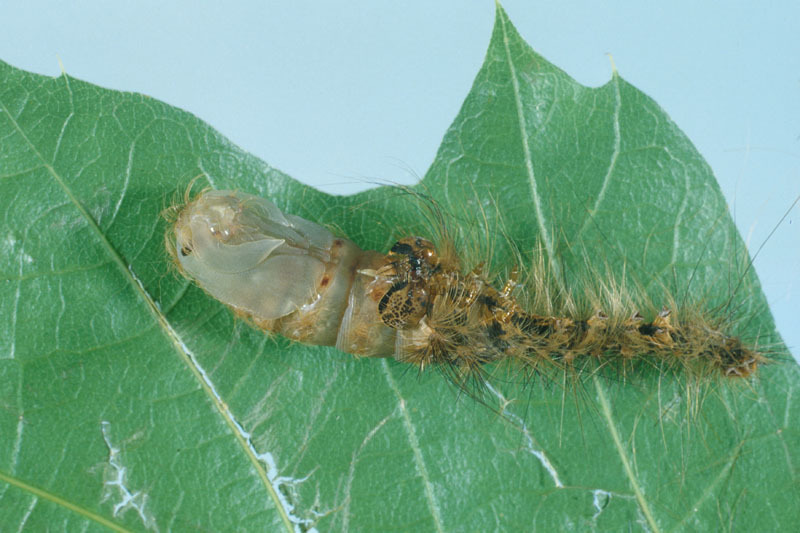 Gypsy moth damage is caused exclusively by the caterpillars, which feed on developing leaves in May. Newly hatched larvae are hairy and black and feed by chewing small holes in the surface of the leaves. 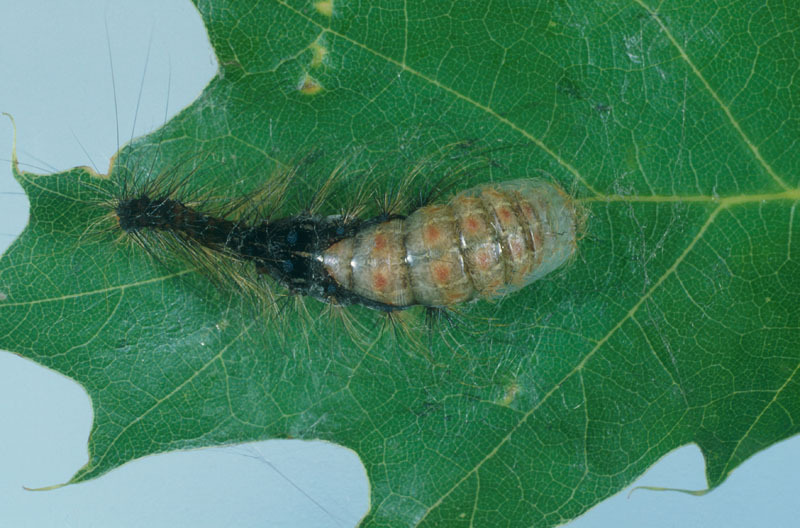 Older larvae devour entire leaves. The body of the larvae are dark-coloured and hairy, with red and blue spots on the back. Full-grown larvae can be up to 65 mm long. 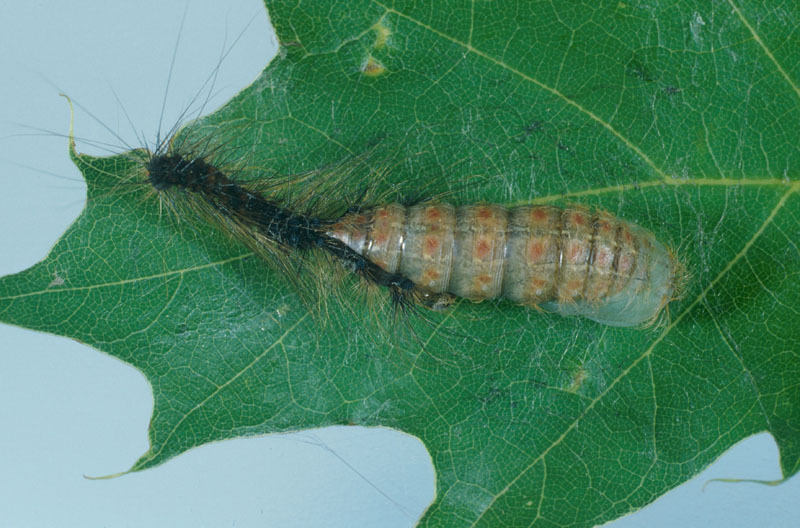 Another sign of gypsy moths is the presence, in late July, of spongy egg masses covered with tan or buff-coloured hairs from the female’s abdomen on the trunks and branches of trees or in forest debris near defoliated trees. 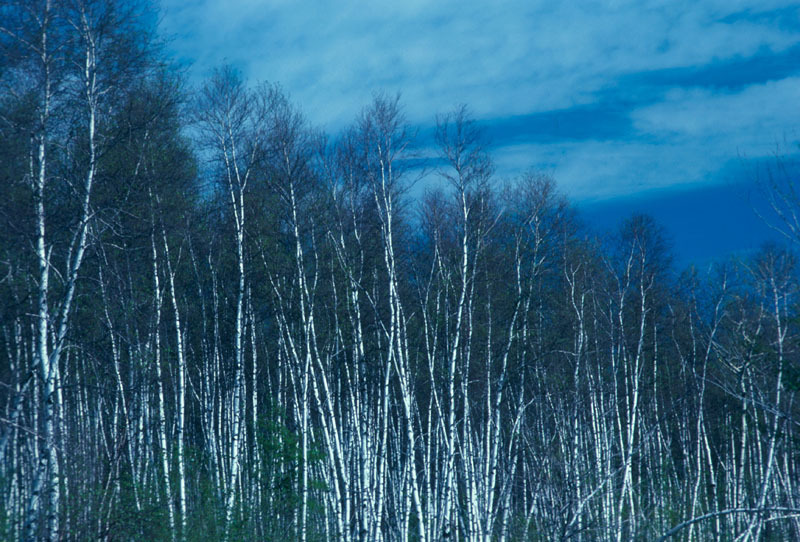 During severe outbreaks, trees and shrubs are completely defoliated over large areas. Despite the trees’ ability to produce a new crop of leaves over the summer, the damage causes significant growth loss. Understorey shrubs and plants may also be affected. Mature larvae feed at night and congregate in shady areas during the day, particularly in the litter near the trunks of affected trees. When the tree is completely defoliated, the larvae vacate the tree and migrate in groups in search of new sources of food. Upon completion of their development, the larvae pupate, often in the same shady areas where they take refuge during the day. The adults emerge in July. The females, which are too heavy to fly, lay up to 1000 eggs per mass, often near the pupation site. The insect overwinters in the egg stage. 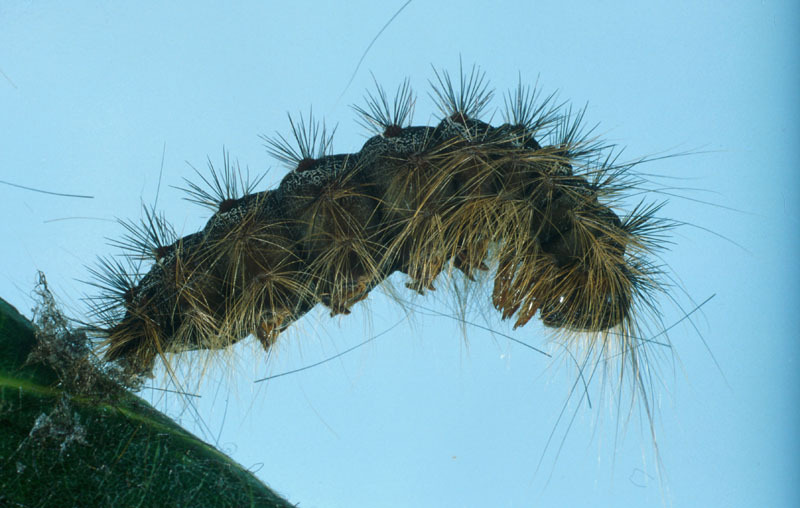 A species of Eurasian origin, the gypsy moth was introduced to the United States in 1869 and has become one of the most serious defoliators of hardwoods in North America. This polyphagous insect also feeds on conifers. The gypsy moth was first detected in Canada in 1912 in British Columbia, where egg masses had been accidentally introduced on young cedars from Japan. However, the first infestation in Canada occurred in 1924 in southwestern Quebec, near the U.S. border, followed by a second infestation in 1936 in New Brunswick. In both cases, the insect was eradicated through intensive egg mass removal campaigns. The insect was again reported in Quebec in 1955 and since then, has become established in southern Ontario, New Brunswick, Nova Scotia and British Columbia. Populations vary annually, depending on the region. 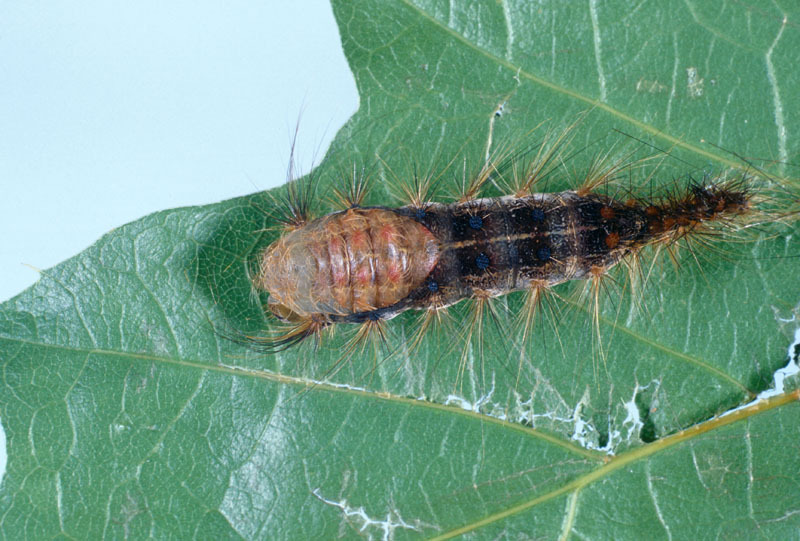 A quarantine pest, the gypsy moth is under the surveillance of the Plant Health and Production Division of the Canadian Food Inspection Agency (CFIA). Annual gypsy moth surveys have been conducted since 1954 using pheromone traps. Because infestations can cover large areas, several Canadian provinces and U.S. states have developed aerial control programs. Since 1975 all populations of Gypsys Moth discovered in the province of British Columbia have been subject to eradication to prevent establishment of this species. To protect isolated or ornamental trees, it is recommended that egg masses found in the fall on trees, stones or any other object be collected and destroyed. In June, mature larvae can be collected when they congregate in shady areas by banding the base of the trunks with tar paper.